I have to say that although it was well-meaning having the words "emergency" and "notfall" in such close proximity, it was concerning - given where we were at the time. I realise that "notfall" means must mean "emergency" in another language and I spent some time with Google Translate trying to work it out, but as yet haven't identified the language. Do you know what language this would be? If you've been to London or Paris, or if you've been here you may recognise the sign. Where was this photo taken? Posted in Activities and tagged sign on Wednesday, 22 September, 2010 by Paul. I know! Was in one of those gondolas not so long ago. :) Looking forward to seeing more pics from your visit in the coming days. That looks like it’s from something clean and new – my guess would be it’s one of the pods of the Wheel of Excellence at the V&A. 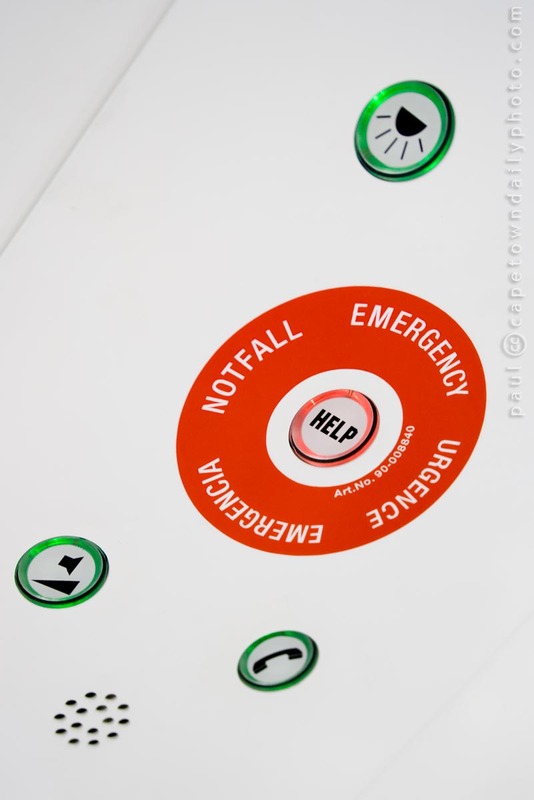 Notfall is German for emergency – pronounced noot-fal (similar to Nootgeval in Afrikaans). No idea, but it is a funny sign. Thanks for the head’s up on the translation… I feel kinda silly for not working it out. Btw: British Airways also have trouble finding correct German words. I found the security brochure on my flight from Joburg to Cape Town.